The name of a color. This can either be a static property name of Colors, or one of the color names that are processed directly as strings. 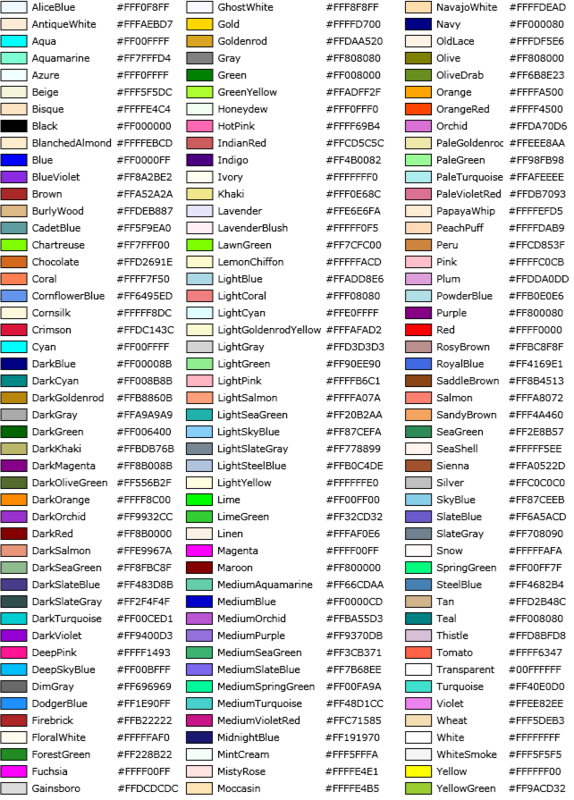 See Remarks for a table of predefined colors. A three-character hexadecimal value that describes a Color. The first character specifies the color's R value, the second character specifies the G value, and the third character specifies the B value. For example, 00F. A four-character hexadecimal value that describes a Color. The first character specifies the color's A value, the second character specifies its R value, the third character specifies the G value, and the fourth character specifies its B value. For example, F00F. A six-character hexadecimal value that describes a Color. The first two character specify the color's R value, the next two specify its G value, and the final two specify its B value. For example, 0000FF. An eight-character hexadecimal value that describes a Color. The first two characters specify the color's A value, the next two specify its R value, the next two specify its G value, and the final two specify its B value. For example, FF0000FF. The ScA value for a Color. Color does not store a specific ScA value, so the provided value will be converted and stored in A. The ScR value for a Color. Color does not store a specific ScR value, so the provided value will be converted and stored in R.
The ScG value for a Color. Color does not store a specific ScG value, so the provided value will be converted and stored in G.
The ScB value for a Color. Color does not store a specific ScB value, so the provided value will be converted and stored in B.
Brush Initializes a new instance of the Brush class. Opacity Gets or sets the degree of opacity of a Brush. RelativeTransform Gets or sets the transformation that is applied to the brush using relative coordinates. Transform Gets or sets the transformation that is applied to the brush. RelativeTransformProperty Identifies the RelativeTransform dependency property. A Color, specified as a string to directly fill a Brush-type property in XAML attribute form. That string is implied to create a SolidColorBrush to fill the value, and the Color you specify becomes the Color property value. This is the syntax shown in the "XAML Attribute Usage" and "XAML Values" sections of this topic. A nonabstract derived type of Brush as an object element, with the Brush-type property in question being specified in property element form. For details, see the XAML syntax on the reference pages for SolidColorBrush, LinearGradientBrush, RadialGradientBrush, ImageBrush, and VideoBrush. It is also possible to derive custom types from Brush. A StaticResource, Binding or TemplateBinding reference to an existing Brush. For more information and examples of the XAML syntax and illustrations of the types of brushes, see Brushes. ImageBrush: Paints an area with an image. VideoBrush: Paints an area with a running video. You can paint using a SolidColorBrush that uses a predefined solid color. This can either be a static property name of Colors, or one of another set of color names that are processed directly as strings if specified as a XAML attribute value. See Color or SolidColorBrush for a table of named colors, and instructions on how to specify named colors in code. To use a predefined color, you can use the XAML attribute syntax for any property that takes a Brush, using the named color convention. Or you can create a SolidColorBrush and specify its Color value as a XAML attribute, using the named color convention. The XAML Attribute Usage in this topic is specifically the SolidColorBrush attribute syntax. The SolidColorBrush syntax is the default behavior if you specify an attribute value string for any property that expects a Brush type. However, if you use a markup extension such as Binding or StaticResource, you could reference any type of Brush.